When you need Greenville, SC pool services, our team at Ricky’s Pools offers the complete package. Pool Services in Greenville – If it’s the start of the summer pool season, no one wants to discover that their pool isn’t working properly. At Ricky’s Pools, our team provides comprehensive pool services for all your needs, so you don’t have to worry about what’s gone wrong. We will address any issues and get your pool working and looking great again. Routine Maintenance – When you’ve been working all day, the last thing you want to do when you get home is clean your pool before you can jump in. At Ricky’s Pools, we provide weekly maintenance, so you can do more enjoying and less worrying. Pool Repairs – Whether it’s a general liner repair or finding a replacement part for your pump or filter, we have the ability to get your pool up and running in no time. You should be able to enjoy your pool instead of worrying about determining how to fix minor problems. Let us do the work, so you can relax and get the most out of the summer season. 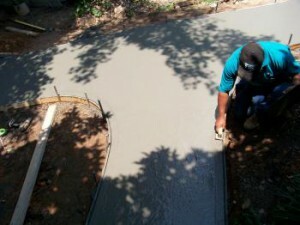 Concrete Work – When you want to create a new concrete patio, or you have a repair that needs to done on your pool deck, we are here to help. We don’t sub–contract our work, so when you call us for a repair, we are the ones who show up to do the work. Ask us about your options for decorative concrete work to make your patios and paths look great all year round. Pool Installation – We offer multiple pool services, including installation, whether you’re shopping for a new pool, bought a pool and need it installed, or you simply need a replacement liner. We complete pool installation projects every day, and with our experience and expertise, you won’t want to go anywhere else. When you need pool services, our team at Ricky’s Pools offers the complete package. If your Greenville, SC pool needs routine maintenance or you just bought your first pool and want to have it installed, we are your go-to professionals for the job. Having a pool can be a great way to enjoy the summer for your friends, family, and neighbors. Give us a call today for all your pool needs!